What is the max. and min. wearing length of the guitar straps? All Overdrive Straps are adjustable in length with either a slider or a buckle. The Seatbelt and Retro Fabric Straps have a standard wearing length of max. 160cm / 62" inch adjustable with a slider to min. 90cm / 35" inch. We also offer the option for extra long length of max. 180cm / 71" inch or extra short of max. 140cm / 55" inch. These options are listed at the product page of the straps. The Full Leather Straps have a standard wearing length of max. 140cm / 55" inch adjustable to min. 95cm / 37"inch. They're also available extra long: max. 155cm / 61" inch adjustable to min. 105cm / 41" inch wearing length. To leave more room for the pretty fabric on the Full Leather Straps with a print, we leave out the hole for the shortest wearing length on these models. Min. wearing length on Full Leather Straps with fabrics print is 100cm / 39" inch for the normal size and 110cm / 43" inch for the extra long option. If you desire a special length feel free to contact us and we can make your strap your way. All Seatbelt, Retro Seatbelt and regular Full Leather Straps are 5cm / 2" inch wide. The Slim Full Leather Straps are 24mm / 1" inch wide. The leather of my strap won't fit well on the end of pin of my guitar.. The end pins on guitars differ, some are larger than others. We deliver your strap with a narrow incision for tight locking. Your strap will adjust to your guitar in time. If your guitar however happens to have a larger than usual end pin, the incision could perhaps be a bit too small. Please try to make the incision a bit longer by carefully cutting it with a sharp knife, be cautious and cut slowly! Can you customize straps any further than the options? We do not have the equipment to personalize straps with own engravement of names or logo's unfortunately. We hope to make this possible in the future. We do customize straps in the way of making a strap with your prefered options: leather/hardware/belt colour and length. If you see a fabric pattern that you would like to have sewn on a different belt color, contact us and we will let you know if that is possible for that fabric. Which strap model is most comfortable to wear? Which strap is most comfortable depends on the player, of course. This is a personal matter. The Seatbelt straps and Retro (Seatbelt) straps are found to be very comfortable, they're lightweight and tend to slide over your shoulder a bit as you move your guitar around, which most players find very nice as it gives a sense of free movement. If you prefer a super sturdy, more heavier feel on your shoulder while playing, the Full Leather 5cm / 2inch wide straps are the way to go! If you play gigs with no shirt on, or a very low neck shirt, there are some Retro strap models that are less suitable: The 'Wildflower', 'Woodstock' and 'Oriental' Retro strap models have a little ledge of fabric over the edge of the Seatbelt webbing which can cause a scratchy feeling when worn on bare skin. How to connect the camera straps to a camera? Our camera straps are connectable through the leather loop or with provided ring. You can open up the leather loop by unscrewing the little screw. Now you can loop the leather through your camera's strap connection part. Or you can use the provided rings to attach the strap to your camera. For the longest possible lifetime of your Overdrive Strap we recommend you to maintain the leather. In order to prevent dehydration of the leather end tabs, it is advisable to grease the leather every so often. When the leather shows signs of little cracks, you're actually a little bit too late. Please care for your strap and it will stay in great condition for many many years. We use full grain high quality leather. Though over time your strap, mainly the leather, will begin to show signs of use; your strap characterizes! This is normal for a natural product like leather. 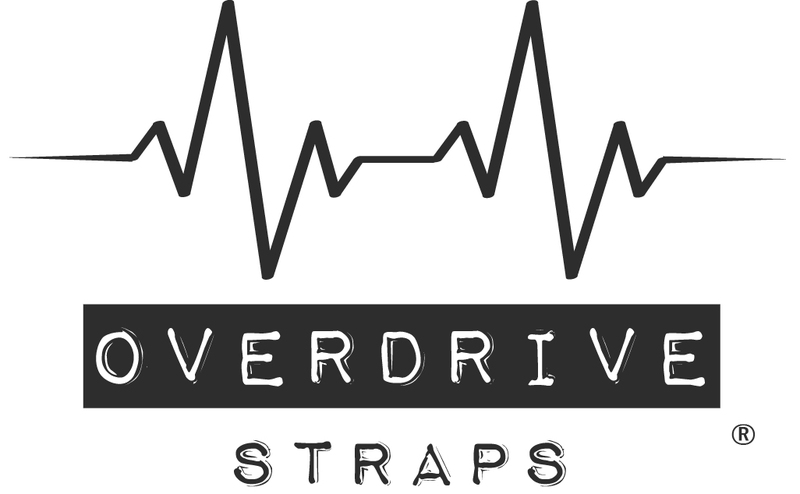 Find one or more Overdrive Straps that you would like to purchase by searching in the categories. Once you have found what you like, you can place one or multiple straps in your 'shopping cart'. When you're ready to proceed to the check out, click on the shopping cart button in the right above corner and follow the steps while filling in the asked information. Once your order has been placed, you will receive an automatic confirmation email from us. You will also be notified once your order has been shipped. Our straps can be delivered to every country that is accessible by the world wide postal network. See the other questions below for more info on shipping costs etc. Worldwide NON-EU countries: €12,95 (Approx. $14 USD) - This price is ex VAT taxes, because your end total will be calculated ex the 21% EU VAt tax. All straps are sent as small certified parcel post items. * The 5cm/2inch wide full leather straps however can not fit in a small post parcel and have to be sent as regular sized parcel which have a higher shipping rate. Ordered straps will be made and shipped within a few working days. You will receive a send confirmation. We are based in The Netherlands, Europe. Delivery lead time depends on where you live. * These estimated average lead times are no guarantees. Please be aware that we have no influence on the shipping lead times. Delivery is handled by the national post company. We ship all straps orders as certified priority mail or insured parcel delivery. You will be informed with Track & Trace information. We will always inform you once your order has been shipped. If for some reason you are not happy with your Overdrive Strap it is of course possible to return it. A strap however can only be returned if UNWORN and you didn't damage or affect it in any way. As long as the strap is unworn and has never been put on a guitar, we don't require you to return your order within a set amount of time altough we of course prefer it if you let us know asap. So this is easy when you gift a strap to someone. Please do contact us prior to returning an order and we will advice you on how to do so. We ask you to return the strap in sturdy packaging and please put the strap itself in a little plastic bag so it can not suffer any water damage along the way. If the strap reaches us in bad state, by your neglect, we have the right to not pay you the full refund or any refund at all. We highly recommend you to send the return with a trackable and insured post/package service, we are not responsible for your return shipment when it gets lost or damaged along the way during transport. Once we have received your return well, you will receive your refund payment as soon as possible (within a few days). Your refund will be done in the same way as you paid for your order, for example through PayPal if you have paid with PayPal. Please note: you will not be refunded the original shipping costs and we are not responsible for your returning costs. All prices are listed INCL. 21% Dutch VAT Taxes. By law, all EU customers have to pay these taxes. EU shipments will not get any customs checks. All orders to non-EU countries are with 0% VAT Taxes, the total price gets deducted and corrected when you have selected your country at the order check out page. At the customs your country's local VAT rate may be applied by customs. For the USA all packages with a worth lower than $200 pay NO import costs or local taxes. So there's no extra costs at all in that case! Most low worth, small post parcels get processed with NO added local VAT. But if customs do decide to charge local VAT taxes we are not responsible for this. Not every country in the world is listed in our ordering process. Please get in touch with us at info@overdrivestraps.com and we will add your county to the list asap! Bank Transfer - For some countries we also offer manual bank transfer. You will receive an invoice automatically after placing your order. You can just transfer the amount to our European IBAN bank account. Please make sure to select Euro as currency when making the payment. The paying methods we offer automatically convert the € amount to your currency. This way you can easily pay without having to worry about currency exchanges. For Europeans: when you have chosen the paying method 'Bank Transfer' you will receive an invoice in € Euro's. When making the payment you should make sure that you select the currency € Euro. Something went wrong while placing my order, what now? Don't worry. Just contact us and we'll work it out! Something went wrong when placing your order and you are not sure if your order has been paid for. Please check your bank account, creditcard of Paypal account if the amount has been debitted. If yes, we will process your order. If no, please try to order again. If you keep having trouble please try antoher paying method or contact us. If your order was accidentally paid for twice, we will ofcourse transfer you the overpaid amount back asap. I have placed an order and realise I have made a mistake in my address, now what? Please note that when you edit your address at your account info at 'My Account', these changes will NOT apply to your already placed order! So please contact us by email to notify us about any mistakes or missing info you have realised. Can you give me or my band an endorsement? We get daily requests for this.. As a starting company we cannot afford big discounts or even to giveaway straps. We don't offer sponsorship programs, the guitarists you see rocking Overdrive Straps have purchased them because they love them. Our straps are handmade by us with much dedication and the use of the highest quality materials, which don't come cheap.. they're no freebies. Can I become a dealer of Overdrive Straps?